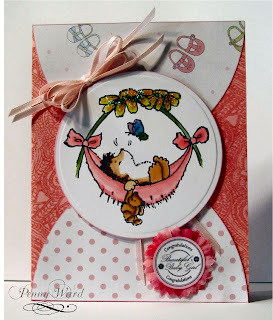 For the CardPatterns challenge I used Penny Black Baby Hammock stamp. I colored with copics and added stickles to the flower. The background is Penny Black Paisley Outline embossed with Clear Sparkles embossing powder. Added a bow and digi stamp sentiment from Nettys Cards. What a sweet card. I'm glad you got to play with Card Patterns this week.